nical Engineering and Technical Journalism, University of Applied Sciences Bonn-Rhein-Sieg, Bonn, Germany. Received May 3rd, 2011; revised May 30th, 2011; accepted June 7th, 2011. Rayleigh and Rician fading channels. used in communication systems . 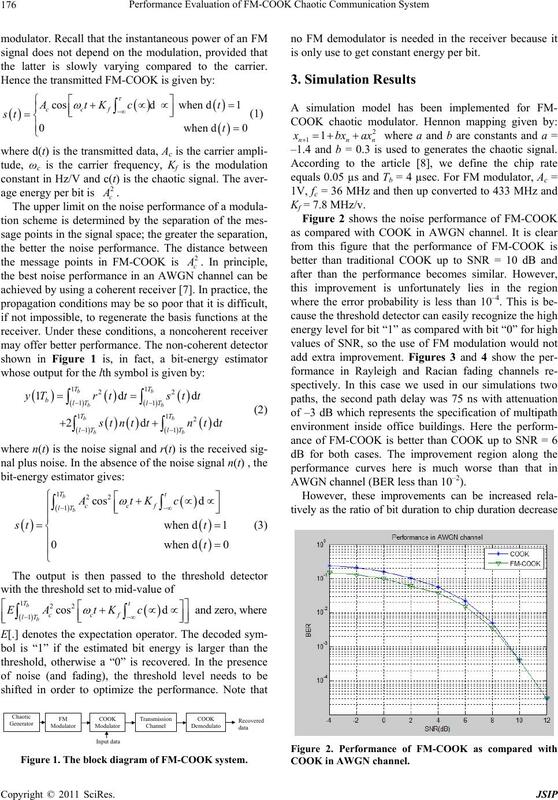 noise performance of modulation system. prove the speed of chaos shift keying. 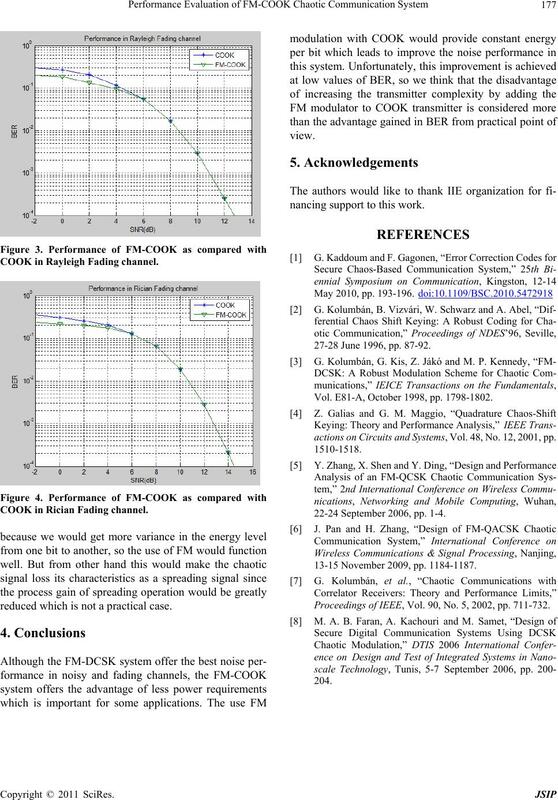 Then in 2006, Y.
performance of FM-COOK modulation scheme. 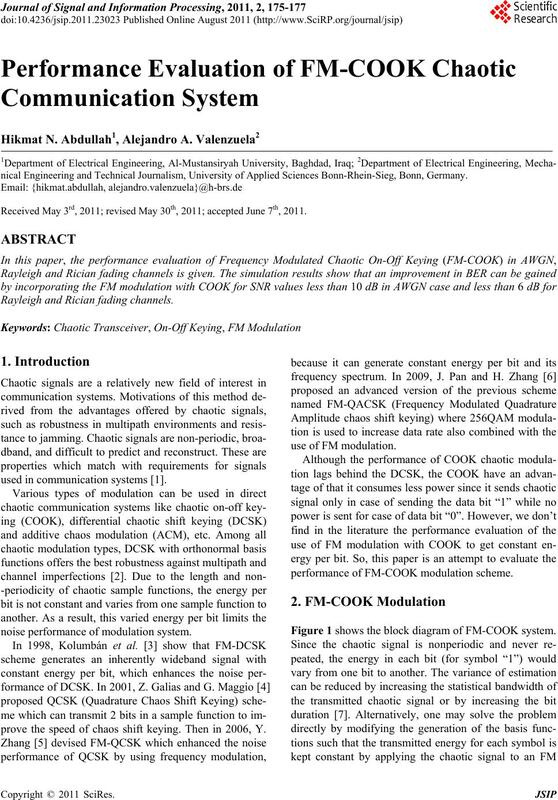 Figure 1 shows the block diagram of FM-COOK system. the latter is slowly varying compared to the carrier. Figure 1. The block diagram of FM-COOK system. is only use to get constant energ y per bit. –1.4 and b = 0.3 is used to generates the chaotic signal. AWGN channel (BER less than 10–2). COOK in Rayleigh Fading channel. COOK in Rician Fading channel. reduced which is not a practical case. nancing support to this work. 27-28 June 1996, pp. 87-92. Vol. E81-A, October 1998, pp. 1798-1802.
actions on Circuits and Systems, Vol. 48, No. 12, 2001, pp. 22-24 September 2006, pp. 1-4. 13-15 November 2009, pp. 1184-1187. Proceedings of IEEE, Vol. 90, No. 5, 2002, pp. 711-732.